Fall is finally here! I’m so excited as I always look forward to this time of year when the cool autumn months remind me to get back to work and begin my fall chores. This is always a wonderful time to take a break and sit in the garden, enjoying the fresh air and the fall burst of color that begins to take shape in late August. But as an avid gardener, there is still work to be done, and this is the perfect time to make any changes or add new plantings that will offer even more textures and interest to my forever-changing fall display. Yes, It’s autumn – yet my garden is blooming with color and delight! For most of us, when incorporating fall colors into a landscape one quickly thinks of trees or shrubs that bear colorful leaves or interesting bark. But let’s not forget about all the other choices available that can also turn any summer garden into a fall bouquet. Although spring is the most common time to begin working in the garden, I prefer the fall as it can provide an even better opportunity to play in the dirt. That said, cooler temperatures could equate to substantial sales at the gardening centers – so why not take advantage of the discount incentive. Mums aka Chrysanthemum – Garden mums are a popular fall-blooming flower and it’s no wonder: they”÷re hardy and able to survive winters in Zone 3. Their stout stems and long-lasting flowers make them excellent cut flowers for any fall table settings. Available in a variety of colors — including white, red, yellow, pink, and orange — and sizes and shapes, depending on the variety and how they’re grown. Pick the plants that are in bud, not fully open. You will be able to enjoy the flowers much longer if they bloom for you in your garden instead of at the nursery. If they have opened already ask for a sale price. If you want them to be perennial, you need to make sure you get the plant in the ground before the end of October. The longer you wait to plant it, the less likely it will have the chance to come back next year. I enjoy mums in my containers and flower boxes for the months of September and early October, and then I quickly offer them to friends and neighbors to get them in the ground. Remember to keep them watered in the container, because if the mum dies prior to putting it in the ground no amount of water will bring it back! Fall is also a great time to plant trees and shrubs — just try to get them in the ground by mid-November. This gives the plants time to get some their roots established before the hard winter freeze. Autumn Sage aka Salvia “Ò A favorite hot-weather perennial, the Autumn Sage produces great blooms for months through the summer and fall. Red, pink, or white flowers attract hummingbirds and are brilliant accent points against the semi-evergreen leaves of the autumn sage. Hard winters will freeze this salvia to the ground but growth is renewed in spring. Hardy in zones 7-10, the autumn sage is a favorite plant for gardeners in Texas and Oklahoma. Aster – Several different aster species are available for home gardeners and many are hardy through zone 3. All asters have beautiful blooms through fall and are real stars in the autumn landscape. Rich, moist soil will provide the best growth for these fall beauties and full sun or light shade will bring the best autumn flower show. Tiny daisy-like flowers appear in late summer and last through the fall months displaying bright colors of purple, white or pink. Clematis – With over 22 verities on my own property this is one flower I will forever request to be a “Mar must-have!” For the most amazing display of colors and prolific blooms, nothing beats the Clematis as the best of the flowering vines out there. Whether growing on tuteurs, posts or fences or even clambering through a shrub or tree, the Clematis will forever enrich any landscape design no matter how large or small your garden may be. Discover all the different flowering times — from spring to fall — and incorporate them to intermix with each other. Ornamental Kale or Cabbage – These not-so-edible members of the kale family have highly ornamental foliage that is often bicolored or tricolored and tolerates cold weather very well. The large, ruffled and brightly colored leaves look almost like colored flowers and are perfect for the fall color in the garden. Flowering cabbage is an annual plant, meaning it will last just one season. However, the flowering cabbage will flourish in the cool temperatures and often last through December. These plants come in a variety of fabulous colors, ranging from white to pinks, purples or reds a great addition to the fall garden design. The plants grow about a foot wide and 15″ tall. 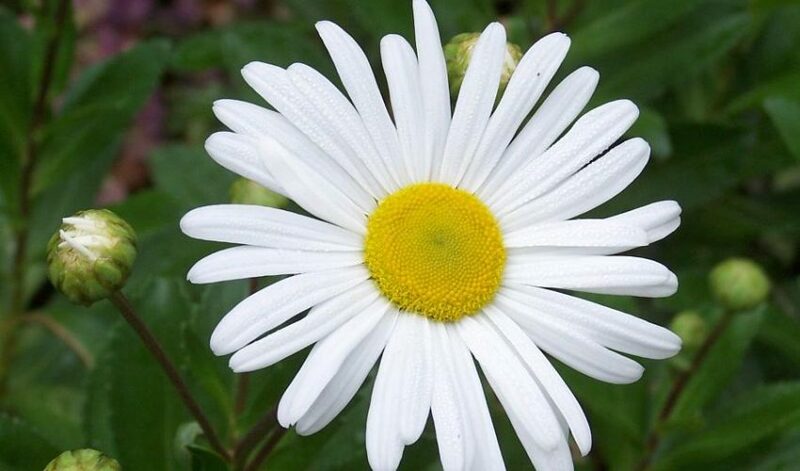 The Montauk Daisy – A shrubby perennial with dark green leaves and white, yellow-centered daisy flowers in fall. Fast-growing and easy to grow — nothing stands out more in the garden among the autumn colors than white. I discovered this daisy while visiting the Hamptons one late September day. I brought back several to enjoy and popped them into a galvanized bucket that I placed at my front door. This was my break–I wanted to do something other than mums. In late October I transplanted them into the garden for future years of enjoyment. I have not been disappointed yet. When selecting a site for this daisy, choose a location that is full sun with average, well-drained soil. The Montauk Daisy will grow 2 feet tall and 2 feet wide. If the plants are not cut to the ground by winter, one should do so in the early spring to control their height. Pinch off tips of new stem growth whenever it is 3 to 5 inches long. Continue pinching as needed until mid-July for best results. Share and divide in the spring every 2 to 3 years so other people can enjoy their crisp white flowers. Vinca Major – An evergreen ground cover hardy to zero degrees, vinca major is a great choice for a decorative ground cover or even container plantings because of its hardiness and texture. Flowering year round, you can expect flowers in the fall, as well as attractive green leaves that will cascade down the edge of a container or planter box. Full sun to part shade is best for the plant, and moderate water. Ornamental Grasses – For fall landscapes, grasses are my favorite texture and interest in a fall garden. The best part is the low maintenance that they require. This is also a great way to add beauty and color without much hard work. I cut mine just prior to Halloween so I can use them for flower arrangements and decorations. They make great cornstalk alternatives for the front door. Even when left to themselves in your garden, Ornamental Grasses make excellent winter interest. Pee Gee Hydrangea – This is a large shrub averaging six to eight feet tall, with some getting up to 20 feet tall and 20 feet wide if left untouched! This variety produces cone-shaped flower clusters as opposed to the round clusters of most other varieties. Flower clusters typically grow up to 18 inches long and 10 inches wide blooming from mid- to late summer through early fall, but the best color display begins in the Fall when they begin to turn pink and then a fabulous rust color. Flowers are easily dried for beautiful indoor arrangements that can be enjoyed year round, so my friends this is another “Mar must-have!” Seek out this plant at your local nursery or discount garden centers- buy it and discover the incredible relationship you will soon have. Lastly, although this tip does not offer immediate gratification, fall, however, is the perfect time to begin planting bulbs for a big spring display. One word to the wise: if you are beginning your garden design and expect to continue to design in the spring, you should wait before planting new bulbs. I learned this the hard way: after planting an aggressive 200 bulbs when I first purchased my home, I quickly broke through most of them the following spring with my new plantings (I knew I’d planted them but couldn’t remember exactly where!) Bulbs should be the very last addition to you garden design. Planting them this prior to completing your garden design might leave you a little depressed and disappointed that all your hard work is ruined by your continued plantings. Let’s also keep in mind the correct depth when planting bulbs, as incorrect levels could damage bulbs — they will freeze if not planted deep enough. Most daffodils and tulips should be planted 6 inches in depth; and small bulbs, like crocus, should be 3 inches in depth. Remember to try to get the plantings in by the end of October. Again, this allows time for the bulbs to get their roots established prior to winter freeze will guarantee that Old Man Winter won’t hurt them. I’ve fallen for the fall garden over the years, now you too can fall in love — and it’s okay if you can’t get up.